West Bengal Joint Entrance Examination Board (with more than 3 lakh student) has conducted the Pen and Paper Based exam on April 22, 2018. It is one of the most crucial exams for students who are willing to peruse their future in the field of Technology in West Bengal. As the conducting Body, WBJEEB has said that the Answer key will release on, the second week of may 2018, it will be the preliminary answer key. one can claim to answer if they think the answer provided is wrong. And then WBJEEB will update the Final answer key and release it in the fourth week of may 2018. And as the WBJEEB is the main path via which one will get elected to best colleges of the West Bengal so there is a lot of things going on with students as well as the coaching Institute of West Bengal. They are getting ready for the Counselling. In between all the crucial Coaching Institutes of West Bengal as well as another part of India have released there answer key in their official websites for the convenience of the students. We have given all the details below so that one can check it properly. What WBJEE 2018 Result Have? Login using WBJEE 2018 application id, password and security pin. WBJEE 2018 result in the form of the rank card will appear on the screen. 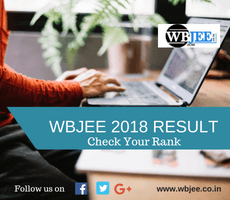 Check the details mentioned over WBJEE result 2018 and download it. Take a print out of WBJEE 2018 result and preserve it till the admission procedure gets over. 1/4th mark will be deducted. NOTE:- Candidates can Challenge the Question(on per question basic) if they think that the answer key provided by the WBJEEB is wrong. Note: All Questions are Multiple Choice Questions (MCQ) based.